Good Morning to All. I am submitting my application to help with documentation and whatever else I can do to help. Thank you for your time and consideration. Hope to hear from you soon. Position: Anything dealing with documentation. Availability: 15 to 20 hours a week until no longer needed. Occupation: I am currently employed by a major Defense Contractor as the documentation manager and tech writer on a Department of Defense program for the software development and maintenance of a tactical biometrics system for the Army. Skills and Experience: I spent 20 years in the Army, many of which were spent as a Master Instructor in control of three national strategic level intelligence systems’ courses for the Army. I was responsible for designing, developing, creating course materials, and teaching many individuals from all service branches on how to operate National Strategic Asset equipment. As a contractor, I developed and wrote the course of instruction for combining two Military Occupational Specialties into one new specialty. Currently, and for the last 13 years, I am the documentation lead for all documentation associated with the development and maintenance of the software and hardware integration for the Army’s biometrics collection program. Motivation: I enjoy the work and understand that the lives of many servicemen and women rest on the accuracy of our system and the documentation that supports it. My interest in helping with 0AD is to be able to contribute, in a meaningful way, to the gamers who love the game and want to know more about it. Personality: I thank god every day for the opportunity to contribute what I can to my adopted family, my country, and whoever else needs my help. 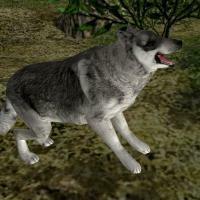 Short Essay: I have been a fan of RTS games for a few years now. 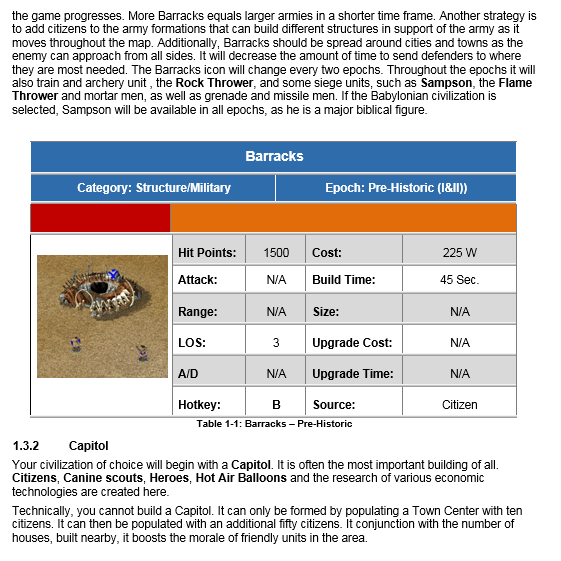 I am currently into Empire Earth, and now more into 0AD. I started with Age of Empires many years ago, moved to the Total War series, with a smattering of time messing with Empire Earth. 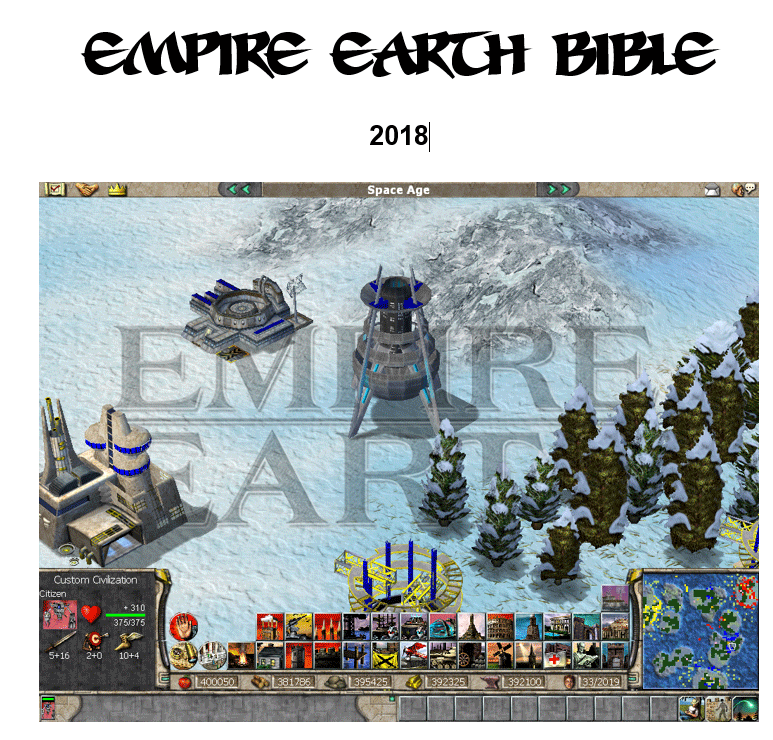 I recently got re-interested in Empire Earth. 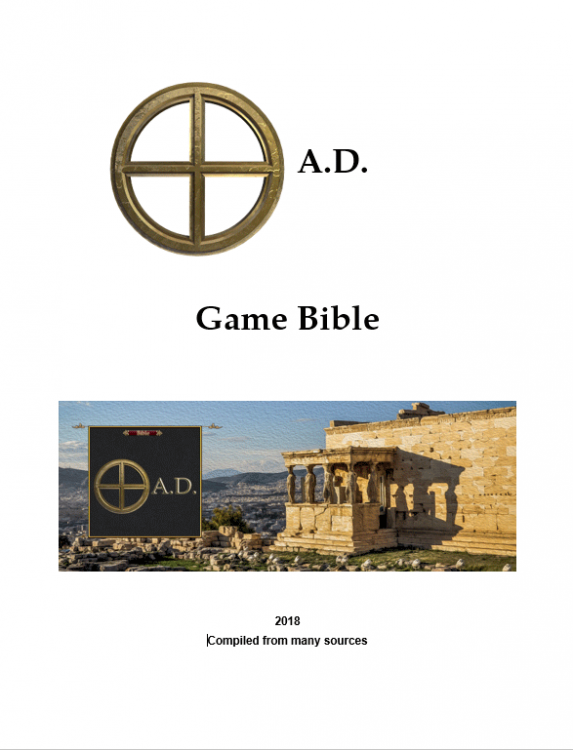 I noticed that all of the games have one thing in common; there is a vast knowledge base for each of the games, but the data is so spread out that it is hard to find a good one-source document. 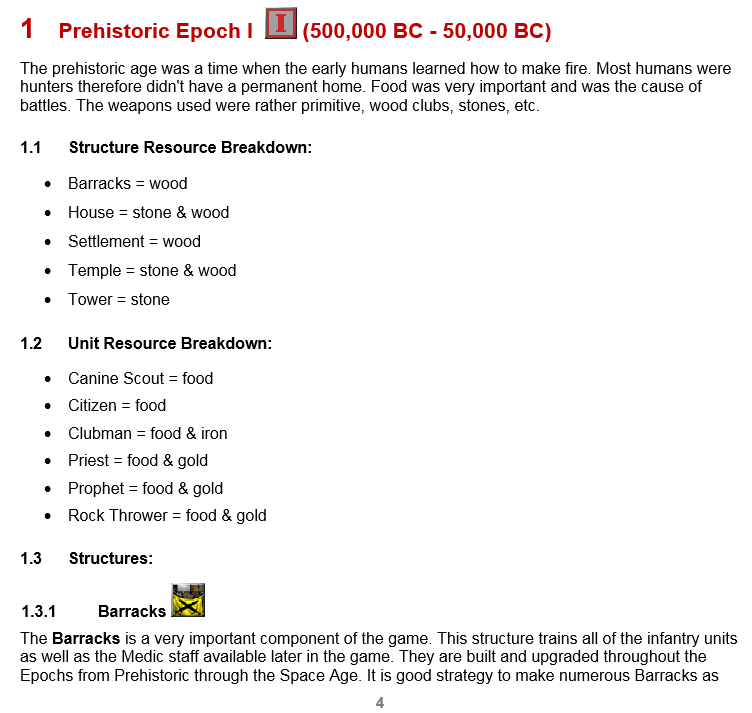 I started working on a guide that I call the Empire Earth Bible, so I can keep track of what is what. Interests and Hobbies: I am into RTS gaming, building and repairing my own computers, photography, martial arts, watching and helping my brothers kids grow up. I also develop websites in my spare time among many other interests. Community: TWcenter, EE.heavengames, and now 0AD. 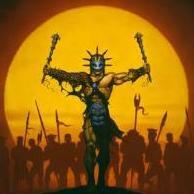 Favorite Game: Empire Earth, but 0AD is caching up fast. I also still like playing Total War: Napoleon occasionally. Work Examples: Most of my latest examples, in the documentation line, are controlled by the government and are not available for public review at this time. Here are a few pages from my first draft of the 0AD Bible and EE Bible I am compiling at the moment, mostly for myself. These are both in the early draft stages and much of it is in the original text as I found it. Only the styling has been added at this point. 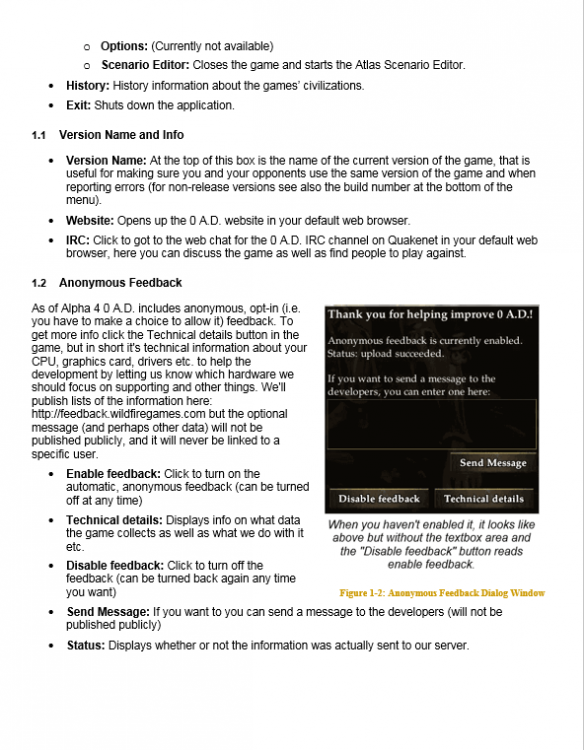 Documentation for players, just like the Game Bible you are showcasing above. Please keep us updated about this guide! Technical documentation, for contributors, modders, etc. You don't seem to propose your help in this area, but you seem to have the perfect skills for it, and we would really need a hand there. Would you be interested by any chance? For both matters, I think the best place for you to get some work to start contributing would be the IRC channel: #0ad-dev on QuakeNet (use this link if you don't have an IRC client). Most people there, including me, are in European time zones though. Hi Itms, and thank you for the warm welcome. I am sorry if I led you to believe I was only interested in user side documentation. I am definitely interested in all forms of documentation that are needed. I would be glad to help with the technical documentation as well. Just point me in the right direction and I will see what I can do to help. What kind of documentation do you intend to start with? Are you familiar with LaTeX, Markdown, XML, or other markup languages? What do you think of https://play0ad.com/ ? Have you already registered at https://code.wildfiregames.com/ and https://trac.wildfiregames.com/ ? What would you be able to do as a team member you can't do right now? There is actually a third kind as well: in-game documentation. Hi Nescio and thank you for the welcome. In answer to your questions, as I stated in my application, I am interested in all forms of documentation needed by the project. I would be very interested in working with the in-game documentation you referred to. I did see several places in the game where the information was sparse to say the least. I have heard of LaTex and Markdown, but have never used them. I am familiar with XML and HTML as I use them in my day work. I use a product produced by Madcap software called "Flare." I am also familiar with Dreamweaver, Muse and Edge (Adobe products) for generating HTML. I use WordPress and ServerPress for website building. https://play0ad.com is where I downloaded the game to begin with. I have also explored many of the links on the "Development" tab (trac) to begin my work on the bible for my own use. I have registered with "code", thanks to your inquiry, but not yet to "trac". I will do that today. Your last question kind of stumps me as I am not sure what the context of the question means. Are not all volunteer,s that are welcomed into the midst, belong to the "team" or is there another hierarchical level that I am not aware of that has a different pathway then the rest of the volunteers? Either way, I do not believe I can truthfully answer that question, being as I was just welcomed and have no idea yet of your project status or what has been done and what is still needed. Is there a POC for documentation or a documentation manager that I can contact to find out where I would be needed the most? If that is you, by any chance, then great. Let me know what you would like me to do. In the meantime I will start looking at the in-game documentation and start researching the information. Indeed there is a difference between the two. Only team members can add their changes to the game directly. Other contributions needs to be reviewed by a team member. so let's say you improve drastically a part of the documentation in the game or in the code it would have to be reviewed before it's added to the game. @Nescio knows the documentation well but @Itms, our project leader should be the one to talk too as he might be the one you need to contact as your changes might only go in with the approval of a team member. Hi Stanislas69 and thank you for the welcome. Thank you, also for the clarification. I just assumed everything created went for peer review and acceptance prior to inclusion in the game, as is done on my project at my day job. Everything we do is reviewed and tested prior to inclusion into our software. I guess, I just assumed it was also the norm for your organization. I will contact @Nescio and @Itms about what is needed most at this time. Thank you, also for the clarification. I just assumed everything created went for peer review and acceptance prior to inclusion in the game, as is done on my project at my day job. Everything we do is reviewed and tested prior to inclusion into our software. I guess, ﻿I just assumed it was also the norm for your organization. Yes, everyone is welcome, we're all volunteers, and anyone can contribute, participate in discussions, create content, submit patches, comment on proposals and commits, create tickets on trac, edit wiki pages, etc. The primary difference is that only team members can commit to the 0 A.D. repositories. Is there a POC for documentation or a documentation manager that I can contact to find out where I would be needed the most? If that is you, by any chance, then great. No, not me, I'm not a team member. I really think that 0 a.D. would have a Wikibook documentation branch. Well we use the Wiki on trac for this. We do have a propensity to host things in house. Is the position available still? Will be very interested in it further. The question is really what people want to achieve. To edit the technical documentation, they can get started right away. The trac wiki is editable by anyone. Posts for play0ad.com can be posted here and we can copy them over if they are good. If we like your contributions and think that you are responsible, you will be invited into the team (whether you wrote an applicaiton or not). One more thing about the technical documentation, I do believe it should be first in the source code (doxygen and JSdoc), and secondly in the wiki. We want everyone who distributes the code to be able to receive that information, and receive it right in place, rather than having to dig out the right article. The technical documentation however has space for articles that don't fit into the source code (for instance an article may not relate to an individual file but an entire folder). Welcome! 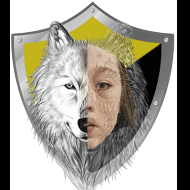 @Doktoreus is still active and looking into some parts of the documentation, but we will never have enough contributors in this area, so feel free to start proposing content and an application. 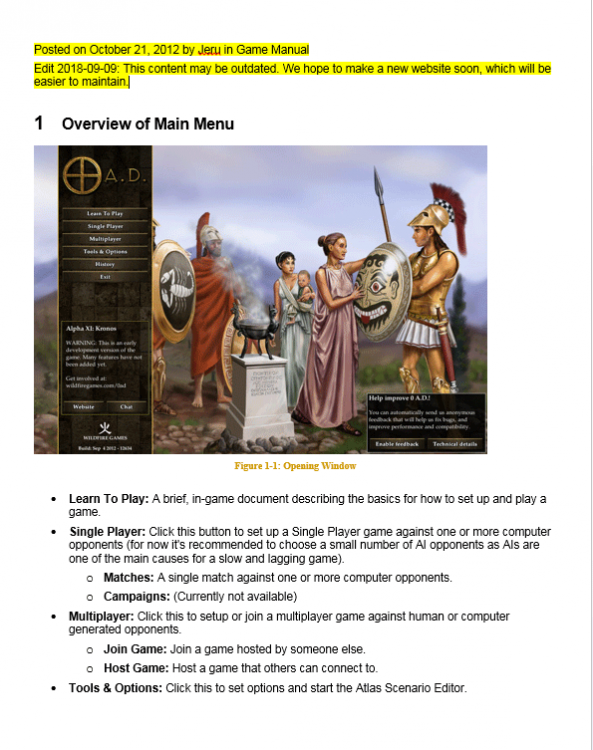 I second elexis in pointing out that we'd like to know which part of the documentation you are interested in (the technical one, or one aimed at players). Thanks a lot! Will definitely do so!